In my desire to give 100% of my attention to my patients, I’ve found it difficult to collect data during treatments without detracting from the sessions. This often results in rushed tallies on a piece of paper for each patient, and then trying to decipher these cryptic messages later when I sit down to write my notes – not the most effective means of documentation. At Constant Therapy, we’ve heard this issue loud and clear from our clinician partners. And we want our tools to help you provide patients with better and more efficient care. So we did something about it. Now there is a new and even easier easy way to access even more data and analytics in one central place. 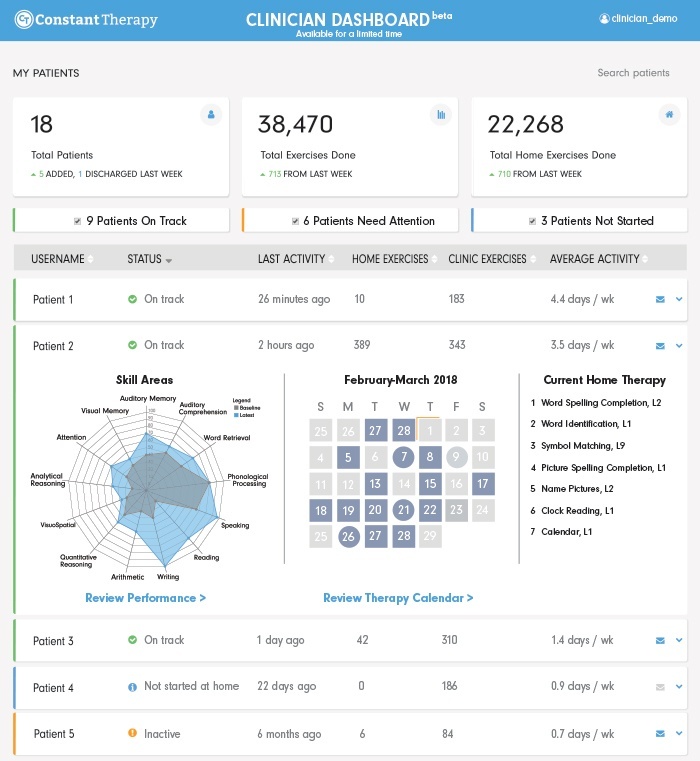 Introducing your Clinician Dashboard – a web-based platform that any clinician can log into from constanttherapy.com/dashboard with your username and password. 1. Easier Than Ever To Use — View your patients’ progress quickly and efficiently, and incorporate into your documentation. 2. Stay Better Connected — Evaluate patient work between sessions, which supports better homework compliance. 3. More Easily Digestible Reports — Use as education tools with patients and caregivers to demonstrate improvement or increased use of trained strategies. 4. Options For Deeper Data Dives — Leverage the Overview for a quick look, or you can take a closer look at patient performance. 5. Improved Performance Tracking — Access reports to help with tracking improvements over time – making it easier to report objectively on changes in performance within a given task, a given skill area, or in functional daily activities. You can easily access all of your patients’ performance in one place. Let’s explore the five different areas of your dashboard. 1. Dashboard Homepage — Clinicians can get a quick overview of patients performance for their entire Constant Therapy caseload. At-a-glance, they see in-clinic and at-home usage, as well as any patient status updates about their Constant Therapy programs. Here, the clinician can see an expanded overview of a patient to view progress through cognitive, speech, and language skill areas, monthly activity, and their current home program. 2. Brain Fingerprint — Each cognitive, speech, and language domain a patient is targeting is mapped onto their Brain Fingerprint. You can quickly view your patient’s baseline and latest scores within each domain. In this example, the patient’s baseline score in Auditory Memory is 30. 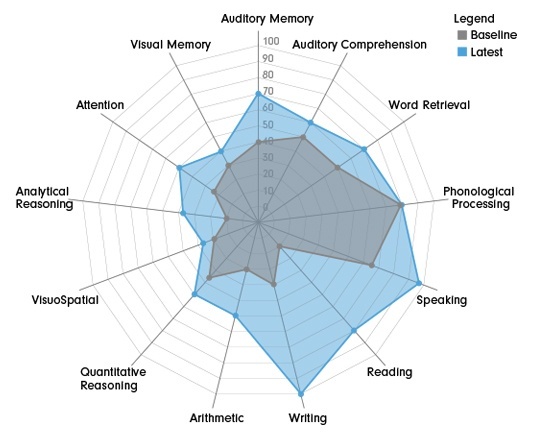 As this individual progressed to more challenging Auditory Memory tasks, their Skill Area Score increased to 70. Within the Clinician Dashboard, click Review Performance to view your patients’ progress. 3. Skill Area Scores — Take a deeper dive into the Brain Fingerprint. Each Skill Area is comprised of a hierarchy of Constant Therapy tasks. 4. Therapies — Analyze patient performance within Constant Therapy tasks. Here’s an example examining a patient’s progress in Auditory Command, Level 8. The clinician can access baseline and latest data on accuracy, latency, and cues. The Clinician Dashboard is here to support you and your patients. As always, we appreciate the valuable feedback we hear from clinicians so that we can continue to support cognitive, speech, and language therapy within sessions and for home programs.